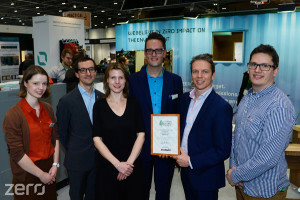 Each year at Ecobuild, the UK Green Building Council (UKGBC) gives exhibitors the opportunity to proudly shout about the green credentials of their exhibition stand. This year, the UKGBC teamed up with Ecobuild’s organisers to look for examples of how sustainability could be incorporated into exhibition stands. Stands were assessed using the following factors: design and sourcing of materials, construction, elimination of waste, reducing materials and energy used, reusing and recycling and displaying the ethical sourcing and fair-trading of the materials used. So who were the winners? Graf’s stand was an impressive example of extensive re-use, having exhibited at several shows globally over a number of years. It was primarily constructed with clever use of the company product that tessellates, allowing for easy transportation. Information display panels were reversible with a variety of languages on either side, negating the need for multiple display walls. including the furniture which was up-cycled from discarded building materials. ZERO intend to use the stand at several other exhibitions. Careful consideration was given to the re-use of this stand’s materials with the panels eventually being installed in the company offices and the carpet being donated to a local youth group. Scrutiny of the supply chain was clearly a priority for SRE as even their sparkling wine was from a vineyard ten miles from the company HQ in Hampshire! SiP’s stand was another fine example of re-use, now a veteran of 4 Ecobuilds and various other shows. This stand also made good use of the company’s product – durable construction panels. SIP’s staff opted to keep stand literature to a minimum, preferring instead to get their brand method across using good old-fashioned talking! Here at 200m2, we are very passionate about sustainable exhibition stands. Our own modular exhibition stands can be scaled to fit any floorspace and can be re-used multiple times. What’s more, we use a range of eco-friendly inks for our dispplay panels to minimise the impact on the environment. Find out more about our exhibition print services here. Storage and transportation costs are also a key factor in an exhibition stand’s green credentials. Our foldable trussing solutions such as TRUSSwire (X-20) can be folded for easy storage. What’s more, our extensive use of composite materials allow for significant weight savings making transportation on long distances very cost effective. To find out more, contact 200m2 via 020 333 200 92. We look forward to working with you on your next project. Next Next post: How to brew the perfect exhibition stand!